The National Agency for Food and Drugs Administration and Control (NAFDAC) said on Wednesday, it had destroyed expired malt extracts and glucose belonging to Guinness Nigeria Plc. The destruction took place at a dump site in Otta, Ogun State. A NAFDAC staff, who was present at the site but prefers to remain anonymous said, “this is a case which has been concluded. 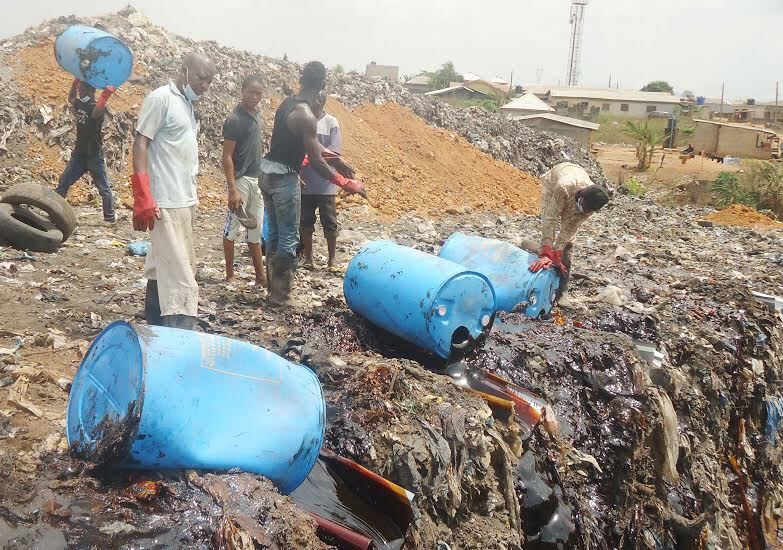 “Guinness has been given permission to destroy the expired raw materials belonging to them while we supervise. On the quantity of raw materials to be destroyed, the staff said, “Each truck has 18 bags for the glucose and another truck of 72 drums of malt extract. On November 19, 2015 NAFDAC had written a letter on ‘Payment of Administrative Charges for Various Clandestine Violations’ to the Managing Director of Guinness Nigeria Plc. The agency said in its letter that the brewer had been involved in clandestine violations contrary to the rules, regulations and enactments of NAFDAC and consequently fined One billion naira (N1bn). NAFDAC’s letter to Guinness further said that the fine was for administrative charges for all the destruction carried out by the company without authorization and supervision by NAFDAC. In addition, some of the regulatory infractions included, “All the re-validation of expired products without authorization and supervision of the agency. It also included the “failure to secure the gates of the warehouse as it is permanently opened to intrusion and exposure to the elements and rodents which invariably affect the integrity of Guinness’ raw materials. Others included poor record keeping and non-compliance with conditions contained in the certificate of re-validated malt extract. This required the storage of the items in cool and dry place and elimination of exposure to sunlight. Others included the submission of a written voluntary consent of forfeiture for destruction of the expired and re-validated raw materials discovered in the warehouse. A source at NAFDAC told NAN that the Investigation and Enforcement Directorate of the agency had gone on site to inspect the warehouse in question and discovered acts that violated the agency’s mandate. The company was subsequently fined N1bn and told to pay it in two weeks. However, an investigation by NAN revealed that the packs of most of the raw materials in the warehouse inspected by NAFDAC were covered by dust and some packs of sugar were torn and open. Some blue barrels of the malt extracts had expired best before/due dates of 04/2015 and 06/2015 while some barrels had white papers on them with an ‘extend to’ dates that were not approved by NAFDAC. In reaction, management of Guinness Nigeria had issued a release saying that they were not aware of their infringements. “The management of Guinness Nigeria does not fully understand the basis for the computation of the administrative charges or the particular regulations alleged to have been infringed. “We are in discussions with NAFDAC with a view to gaining better clarity on the issue and hopefully have it resolved. We remain committed to working with NAFDAC and other regulatory authorities. This is in furtherance of our responsibility to produce and market quality products and look forward to being able to resolve the issue working in partnership with NAFDAC’’, the statement had said.